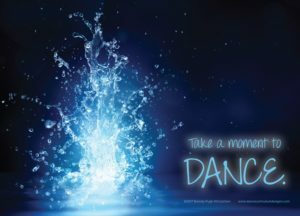 If you attended the 2017 NDEO Conference, you received, from Dance Curriculum Designs, a gift poster with a photo of a water splash that is frozen in time. We were searching a stock photography site and Brenda Pugh McCutchen found this image and was fascinated by it. There is so much movement in the parts of the splash, with beads and streams going in different directions. In the center of the splash, you can almost see a figure, like a dancer, and can imagine that the drops flying are the result of the movements from this dancer. For me, the image evoked a strong sense of time. It is a captured, brief moment of beauty and emotion. I captioned the poster “Take a Moment to Dance,” hoping to convey the sense of time as well as the sense of movement. Our lives are hectic and busy. Sometimes, as educators, we spend our time doing the nuts and bolts of our profession and guiding others in their creativity. We forget or push aside our need to be creative, leaving us wondering why the thing we love is not bringing us joy. So, here is a reminder. Dance in the wind with the leaves on the trees. Dance to the rhythm of your heels on the sidewalk. Dance in the shower with the water spraying all around. Dance with the broom or the mop or the dust cloth. Dance because you finished your paperwork. Dance with joy. Dance with sorrow. Dance with a friend. Dance for yourself. Take a moment to dance.